Although “The Diary of Anne Frank” received a Broadway revival in the late 20th century, and the film version won multiple Academy awards (including Best Director for George Stevens and best supporting actress for Shelley Winters) and is included by the American Film Institute in its list of the 100 Most Inspiring Movies, few theatre reviewers or critics (including myself) would be likely to think of it when reflecting on the best American plays. It is easy to dismiss it with faint praise as a staple of amateur theatre groups and a well-meaning but fairly pedestrian workman-like drama. I intend a great compliment to this production by the amateur group, Fringe Visual and Performing Arts, when I say that they convinced me that this is indeed a great play with their polished, sincere rendering which delivers the story with clarity, keeps it entertaining, and packs the requisite emotional wallop. Director Maria Stats makes excellent use of the small space, assisted by set designer Linda Howard, arranging furniture on a small stage to persuasively recreate the “secret annex.” Without benefit of stage lights, proscenium, are other theatrical accroutrement, the company does a remarkable job of holding audience attention. Athough amateurs, or students, each of the actors performs well. There are no major flaws in performance. As Anne, young Molly James Stats has an infectious energy and quick-wittedness that suits the character perfectly. She does a fine job of relating to the other characters in the play, each one differently, showing us a full emotional life. She particularly shines in an intimate scene with Xathanael Todd as Peter Van Daan, when she first visits him in his room as they develop a puppy love romance. Both teenagers do a fine and convincing job of acting throughout. Another very young actor, Mark Bennett, demonstrates exceptional talent as the dentist, Mr. Dussel. Athough many years too young for the part, Bennett easily draws us in by making no attempt to age himself, but simply delivering the lines with absolute sincerity. He has been expertly coached, and rises well to the occasion. As the rest of the Frank family, Luke Winders as Mr. Frank, Linda Howard as Mrs. Frank, and Emma Sutherland as Margot all give good performances. As Mrs. Frank, Linda Howard is especially effective in a culminating dramatic scene where she confronts a thieving Mr. Van Daan, and breaks down emotionally under the pressure of the family’s situation. As Mr. and Mrs. Van Daan, Bryan Payne and Jennife Preciado are both fine. Bryan Payne is quite moving in his moment of despair and shame when he is caught stealing food. Jennife Preciado gives a professional-level performance as Mrs. Van Daan, setting a high bar for all the actors on stage. It is a finely written part, for which the actresses in both the original stage version and the film version won major awards. Preciado does the role justice. Sarah Rozett as Miep, and Mark Bennett as Mr. Dussel, remain to be mentioned. These two are the friends and colleagues who shelter the Frank family, and they are both very effective. If you have not seen the play recently (or at all, for that matter), or have teenage children who have read the diary, this would be a fine experience. Given the current circumstances in our country, there is much in the play that seems remarkably relevant. At one point, Anne cries out that “Children come home from school to find their parents gone. Thousands are being deported every day!” We should listen. We need look no further than the day’s headlines to know that this is happening here and now. This is as real as can be. And if you live in Vallejo, you should certainly know about On The Fringe Visual and Performing Arts, who have taken up residence at Artiszen Cultural Arts Center, downtown. 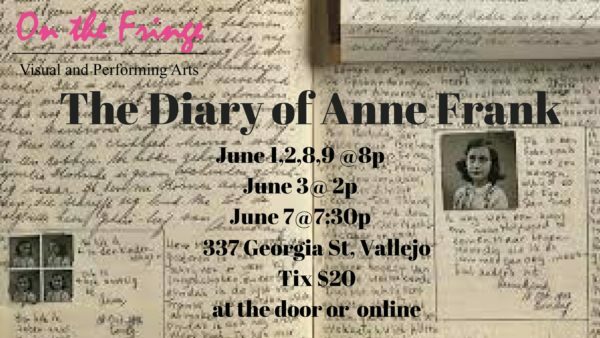 “The Diary of Anne Frank” closes tonight, June 9th. For further information,click here. “The Diary of Anne Frank”, dramatized by Goodrich & Hacket. Produced by On The Fringe Visual and Performing Arts. Director: Maria Stats. Sound Design: Keith Thompson/Ken Stats. Costumes/Props: Maria Stats and Cast. Set Design: Maria Stats/Linda Howard. Set Construction: Dr. Robert Sansone. Anne Frank: Molly James Stats. Mr. Frank: Luke Winders. Miep: Sarah Rozett. Mrs. Van Daan: Jennife Preciado. Mr. VanDaan: Bryan Payne. Peter Van Daan: Xathanael Todd. Mrs. Frank: Linda Howard. Margot Frank: Emma Sutherland. Mr. Kraler: James Adams. Mr. Dussel: Mark Bennett. 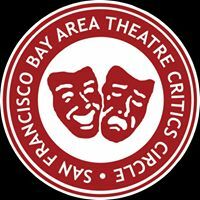 Posted in Reviews.Tagged Artiszen, Bryan Payne, Charles Kruger, Emma Sutherland, James Adams, Jennife Preciado, Linda Howard, Luke Winders, Maria Stats, Molly James Stats, On The Fringe Visual and Performing Arts, Sarah Rozett, The Diary of Anne Frank, theatrestorm, Xathanel Todd.